Mannheim-based Rhein Chemie, a wholly owned subsidiary of specialty chemicals company LANXESS, is celebrating its 125th anniversary this year. Now a business unit of LANXESS, it was founded by two young chemists, Dr. Albert Müller and Dr. Hermann Dubois, and entered in Mannheim District Court’s register of companies on June 8, 1889. However, it was Dubois’ other partner Victor Kaufmann who was responsible for the fledgling company taking the initial steps in its current direction. As early as 1902, he gained a foothold in the up-and-coming rubber sector with a product made from a renewable raw material. Alongside customer orientation, quality and innovation, sustainability has thus been playing a key role in Rhein Chemie’s success story for well over a century. Brands such as Rhenogran®, Stabaxol® and Additin® have made it a popular choice for customers on the rubber, plastics and lubricants markets. The current product portfolio continues to help these sectors conserve scarce resources and develop more environmentally friendly products. “Nowadays, Victor Kaufmann would without doubt be seen as a visionary,” says Dr. Anno Borkowsky, CEO and President of Rhein Chemie Rheinau GmbH. “The company actually started off by producing chlorine chemicals, among other things for cleaning purposes, but then an unexpected opportunity arose in 1886 when Carl Benz developed the first automobile in Mannheim. Kaufmann predicted the huge success of this invention and immediately recognized how important it would be for the rubber industry,” he adds. The company changed course and, shortly after the turn of the century, Kaufmann and Dubois started producing factice – an extender for the valuable resource of natural rubber. Factice is still available, but nowadays it is more in demand for its positive impact on the dimensional stability of thin-walled extrudates. From a historical perspective, though, the technical properties factice was able to give items made of natural rubber is less interesting than the raw materials Kaufmann used for factice production. One of these was rapeseed oil. “This made Kaufmann one of the first people in the chemical industry to support sustainability – at a time when the term didn’t even exist. He would have done so without realizing, but Rhein Chemie kept returning to the concept of sustainability over the decades and developing it further,” continues Borkowsky. Sustainability also remained on Kaufmann’s personal radar in the years that followed. 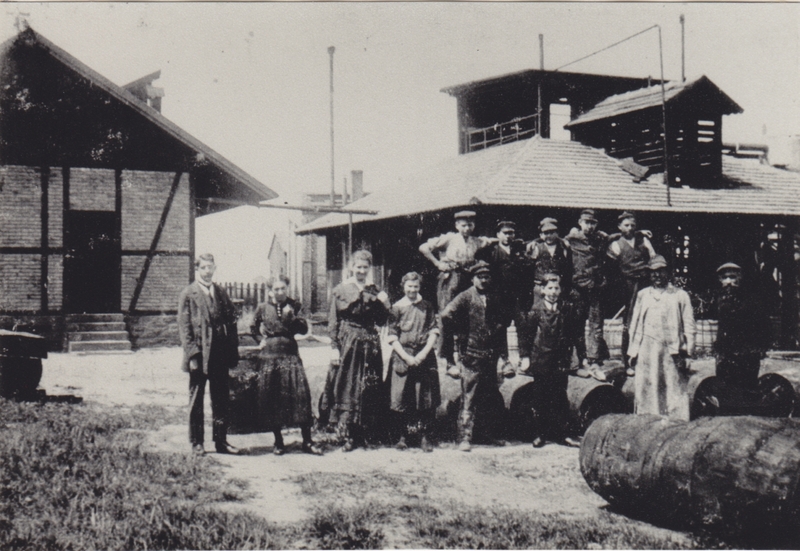 “When the waste piled up during the boom years of the rubber industry and engineers required increasing amounts of rubber, Kaufmann demonstrated his credentials as a rubber pioneer by producing recycled, so called reclaimed rubber from used tires to make technical rubber products such as seals, hoses, conveyor belts and carcasses,” explains Borkowsky. Rhein Chemie’s rubber know-how and innovative products soon enabled it to make a name for itself outside Germany, too. By 1956, the company was already active in 11 European countries. In addition to the focus on innovative, customized solutions, sustainability also remained an important aspect. In 1957, for example, chemists at the company, which was now also making additives for lubricants, developed an extreme-pressure additive for use in the formulation of metalworking fluids. Made from rapeseed ester, i.e. produced from rapeseed oil like factice, this light-colored sulfur carrier was launched under the product name RC 1422. This was the starting point for a fast-growing group of highly specialized additives for industrial lubricants. Over the following years, Rhein Chemie gained a place amongst the technology leaders in a number of segments of this market. When the first products of today’s well-known Rhenogran family came onto the market in 1971, it finally became possible to incorporate rubber additives pre-dispersed in a polymer matrix into the rubber compound very homogeneously and with no dust. Over the following decades, Rhein Chemie also continued developing this promising product family. It now comprises over 100 products that are geared perfectly to their many different applications. The present-day Rhenogran products are currently the company’s number one sales generator. Among other things, they reduce the amount of energy required to produce rubber compounds and help improve the quality and thus the durability of rubber items. Rhenogran CNT will be the newest addition to this ever larger range of innovative polymer-bound additives. It has been shown to facilitate handling of carbon nanotubes – a highly promising development – and the market launch is scheduled before the end of 2014. Rhein Chemie was also quick to move into the plastics sector. The first antihydrolysis agents for polyurethanes were launched in the early 1970s under the brand name Stabaxol and this product, too, has benefited from ongoing optimization ever since. Available in liquid, solid and masterbatch form, the additive now protects a whole host of polymers with important technical applications – including polyurethane, TPE, TPU, PET, PA and EVA – against premature aging caused by hydrolysis. By doing so, Stabaxol extends the service life of plastics that are susceptible to hydrolysis, especially in demanding applications such as spring elements made of cellular polyurethane for the automotive industry and screen fabrics made of PET monofilaments that are used in paper-making machines. Here, as in many other applications, Stabaxol not only helps conserve resources but also makes production more cost-efficient, for example by lengthening maintenance intervals. Over recent decades, Stabaxol has become Rhein Chemie’s most important product for the plastics industry. It even offers a product line called BioAdimide to protect biopolymers against hydrolysis. The lubricant experts at Rhein Chemie also make a point of using sustainable products. This started back in the 1990s with the development of complete formulations of lubricant additives based on renewable raw materials. Special additives in the current Additin portfolio are designed specifically for the formulation of biolubricants. For example, lubricant specialists are currently working hard on a new additive package for hydraulic fluids that complies with the latest European Ecolabel guidelines. “From a very early stage, it was important to us to provide our customers with products that meet the strict requirements of national environmental labels in Europe. And this has remained a key aspect of our development right up to the present day,” states Borkowsky. By “the present day” he means under LANXESS because, after more than thirty years under the roof of Bayer AG, Rhein Chemie has been part of the Cologne-based specialty chemicals company since 2004. Rhein Chemie cemented its standing as a leading, globally active supplier of high-performance additives for the rubber, plastics and lubricants industries during the Bayer era and this positive development went from strength to strength when LANXESS became its new parent company. In its anniversary year, Rhein Chemie has production facilities and technical competence centers in Germany, Belgium, China, Japan, the United States, Argentina, Brazil, Russia and India. As is typical of LANXESS, these state-of-the-art facilities ensure the highest possible product quality. Existing facilities are also undergoing further development, with a new Rhenogran production facility currently being built in Brazil. A few years ago, Rhein Chemie even added a completely new group of products to the portfolio in the form of tire bladders, and these have enjoyed impressive growth ever since. “They, too, help produce better, energy-saving tires,” he says. Bladders are rubber membranes that press the tire being formed onto the inside wall of the mold during vulcanization. Good bladders produce particularly uniform tires that benefit from lower rolling resistance and abrasion levels. And thanks to new, pre-coated bladders from Rhein Chemie, the tire industry can dispense with the additional release agents that are currently in widespread use. “The contribution to sustainability that is most important to me personally, though, is our chemistry lab concept for crude and processed rubber. Through this we give young people from the local area the opportunity to find out all about rubber and its possibilities during chemistry lessons and a visit to our laboratories,” says Borkowsky. This educational initiative is geared closely to the Baden-Württemberg region’s curriculum and is being further expanded to mark the company’s 125th anniversary. The project is already proving a success. “Students are telling us that they now understand why high-performance tires can save energy. The future belongs to the young and sound know-how is part and parcel of a bright future,” concludes Borkowsky.